You have just moved into a home with a new above ground swimming pool. Now you are wondering how to maintain and operate your pool. What does the pump do? How do you clean the filter? What chemicals do you need? The information we provide in this section will give you a better idea on how it all works and help you get the most enjoyment out of your swimming pool. Below is a list of the main topics for new owners of above ground pools. Click on the link to go to that topic. All above ground pools need to have the following items for them to run properly. Below is a typical set up of most above ground pools. Please note setup will vary depending on pool size and construction. You can also add a heater and or alternative sanitizer to your above ground pool. Below is the typical setup for this type of above ground pool. Water first enters you swimming pool system by entering the Suction Lines. On the majority of swimming pools these suction lines consist of your pool Skimmers. The skimmers are located along side the edge of the swimming pool. The skimmer is set up to catch the larger debris such as leaves so it does not get sucked into your system. Pool Skimmers get their suctions from the pool pump. The suction can be controlled by switching the Jandy diverter valves. Pool Skimmers are located along the edge of the swimming pool. They are built into the side of your pool. As the pool fills with water it is sucked through the pool skimmer and sent back through the system with suction from the pump. The skimmer basket collects the large debris such as leaves. The basket need to be periodically cleaned to allow proper suction for above ground pools. You can take out the strainer basket by opening the access hatch. This is usually the round or square panel located on your swimming pool deck. If you need to replace the skimmer basket or floating weir please use our Pool Parts section. After the water goes through the strainer basket is continues on through the suction line and back to the multiport valves. There is a second Equalizer line that keeps the skimmer from drawing air into the swimming pool. The equalizer line leads back into the pool under the weir door. 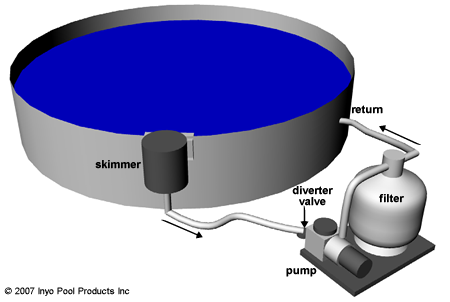 The skimmer and main drains are separated by the pump using multiport valves. These valve are usually 2 or 3 way valves. They divert the water from one area to another. So you can use the diverter valves to take some of the suction from the skimmers and put more into the main drain. You can also shut off one of the suction lines completely as needed. Jandy Valves can be automated and controlled by a control panel. This will be discussed in more detail in a later on this web site. You will however need Valve Actuators that are connected to your multiport valves. After the water flows through the Diverter valves they are sucked into the pump. After the water exits the pool pump it goes into the pool filter.There are three main types of swimming pool filter systems Sand, Cartridge, and D.E. filters. Water enters these systems and filters through the system using methods that is dependent on the type of filter. There is maintenance that is required for each type of filter. Each type of filter will have a tank, a lock, and a pressure gauge. The pressure of your filter will vary again according to your swimming pool and system. Here is a breakdown on how each filter looks like inside. A D.E. Filter is cleaned using Diatomaceous Earth and Grids. The water enters through a multiport valve and goes into the valve depending on what the valve is set to. There are several types of multiport valves and each having different settings. Here is some of the settings for your multiport valve. After the water is filtered and cleaned it is discharged out the pool filter and into the next pool product. This part of the system will vary depending on what options you have put on your swimming pool. There are several options such as heaters, solar heating, and alternative sanitizers (chlorinators). Here are the Chlorinators we have available for above ground pools. Salt Chlorine generators are slowly become the more popular of the sanitizers for above ground pools. The way the generators work is you pour salt into your swimming pool and the salt is used to sanitize your swimming pool. It takes place of the chlorine you place in the pool and also gets rid of the chlorine smell or irritation of the eyes. The control panel will let you know how much salt you need to put into your swimming pool. 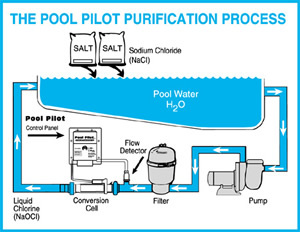 Please consult our owner's manual section to find out how to use your salt chlorine generator.